Slight correction. After setting a Level Sequence to play for the first time, the branch in DoEvents will always return true since it was just checking isvalid. What I ended up doing is creating an additional bool called "HasLevelSequence" in Dialogue.h and using that as the branch condition in DoEvents. 1. When I have a pure NPC dialog, the conversation doesn't end when I click to continue into the last dialog line. But, with a PC answer, the dialog finish normally. Is this correctly? Or it's a bug in my project? Well, usually dialogues end with a PC line. If you want them to end with an NPC line, then depending on the game, the behavior would differ in this particular situation. In Dark Souls, the last NPC line would linger on the screen for a few seconds, but you'd already be effectively out of the dialogue. In Baldur's Gate, the line would appear normally and then you'd have an [End Dialogue] PC response generated automatically for you. So it's not exactly a bug, it's just something I never implemented. Call it a slight oversight. Hard to answer about your other two questions without looking at the project. They're more general purpose UMG type of questions. Last edited by CodeSpartan; 05-04-2017, 10:22 PM. Getting these errors when compiling your plugin in a custom 4.15 engine. Aside from your plugin throwing the IWYU error where the header needs to be first thing, it seems the code itself in source seems to be from 4.14. Else I don't think I should be getting a IWYU error. This is a fresh copy of the plugin that was installed with the default binary 4.15 from the launcher. I just copied the plugin to my 4.15 engine source and viola, errors. Technically none of these errors make sense since your code is fine. The 4.14 plugin worked perfectly. This is the only plugin preventing me from upgrading to 4.15. Hey. So I'm in the middle of updating the plugin to 4.16 and I just had some of the errors you're having. Fixing them was a matter of including parent classes into headers when you're using something in cpp, like Super. So for example adding #include "Runtime/Engine/Classes/Engine/DataAsset.h" into Dialogue.h fixed the error of "'UDialogue': illegal member initialization: 'Super' is not a base or member	UE4". Then there are some errors like 'DialogueWave': is not a member of 'FDialogueNode', they can be fixed by adding forward declarations into .h files, so in Dialogue.h I added class in front of UDialogueWave* DialogueWave = NULL; and that fixed that particular error. Try these two fixes and see if it compiles, I didn't have any errors after that, although I had a long list like yours when I first tried to compile. I'm fixing those things now for 4.16, so hopefully you won't get any errors like that with the 4.16 version. I'll try to send it to the marketplace in a few days. Last edited by CodeSpartan; 05-26-2017, 12:26 PM. Sent the plugin for review. Should be up on the marketplace soon. @Sbnewsom, I also compiled it in the github version of Unreal just to see how it would behave, because I remember that's what you were trying to do, and it worked. Last edited by CodeSpartan; 05-26-2017, 03:21 PM. This is exciting! This gives me hope for the next build. Fingers crossed (I'm sure it'll work, no problems ) I really appreciate the help btw. Looking into exporting and import dialog right now. How does the plugin store this information? Is it individual arrays? How does the plugin store this information? 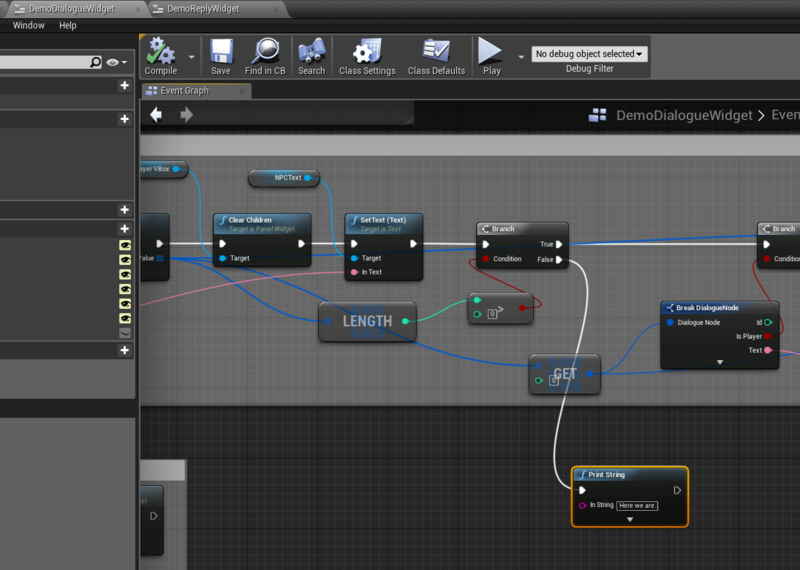 Each dialogue file (UDialogue found in Dialogue.h) has an array of nodes (FDialogueNode) and a few simple variables. Each FDialogueNode (also found in Dialogue.h) is just a struct that has things like node id, text, etc. So if you want to export a dialogue, you need to export the four UPROPERTIES that you have in UDialogue, and that's it. 4.16 is up on the marketplace. I am still getting the header include problem? Thats so weird. Whats even weird is that such errors shouldn't have been able to compile for CodeSpartan and Epic because of the new format in 4.15. So it begs the question, why is that? [MENTION=145367]Co[/MENTION]despartan: I haven't compiled this myself yet since Nvidia VXGI hasn't been ported to 4.16 yet, but are the headers first in your source? Or did you disable IWYU bypassing these errors? I only brought up 4.15 because the problems you listed are because of the new IWYU system INTRODUCED in 4.15. This means, if its introduced in 4.15, it will still be a problem in 4.16. The issue won't magically disappear because its not a bug, but it is a new programming rule. Ok thanks. has nobody else had this problem in 4.15 after the new plugin update was released? It looks like you're trying to compile the 4.15 version on 4.16 engine. Just grab the 4.16 version. I was using the 4.16 version.. but seemed to have fixed it. I was somehow using VS C++ compiler for VS2015 in my VS2017 install.. and when I added the 2017 Compiler and removed the 2015 compiler the errors went away.